Share God’s love with neighbors-in-need. Your One Great Hour of Sharing stories and videos found here. In previous decades, traditional mission took place between “suppliers” and “receivers.” This article highlights a multilateral partnership across continents and cultures, a partnership of more than two centuries between the Presbyterian Church (U.S.A.) and Severance Hospital in Seoul, South Korea. I took Elias and Gilbert, Kenyan doctors, to the medical library of Yonsei University Health System in Seoul, South Korea. They came to Korea to be trained in the hospital’s urology department. They walked around in the library and stopped at the urology section, picking up a few books and flipping through the pages. They took out Campbell-Walsh Urology, a textbook regarded as the bible in the field. I could see their sparkling eyes, which seemed like the eyes of children who wanted a toy so much but could not possess it. I told them that they could borrow books from the library, but they politely declined. I felt sorry to see them turn back from the bookshelves. It is not easy for doctors or students in medically underprivileged countries to purchase medical textbooks, because either the books are not available or those who want them cannot afford them. E-books are easier to access but cannot take the place of hardback or paperback books that can be marked up with notes to review. Support from the Presbyterian Church (U.S.A.) has helped to alleviate that problem, however. Support from the PC(USA) to Yonsei has been continuous since Louis Henry Severance, a Christian philanthropist who became wealthy through his work in the oil industry, made the first donation in 1900. 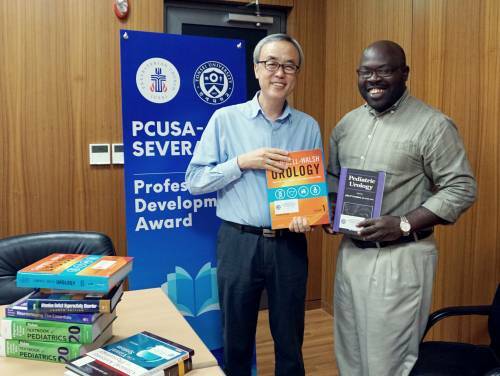 In 2017, Yonsei launched a program to help medical personnel from medically underprivileged countries receive training at Yonsei and receive professional books with funds from the PC(USA). Neurosurgeons from Indonesia and Bangladesh have been trained in Severance Hospital thanks to the support from the PC(USA). The PC(USA)-Severance Professional Development Award provides up to $500 in medical textbooks for each awardee. So far, 20 doctors, dentists and nurses have received this award. Three months after our trip to the library, I asked Elias and Gilbert to choose books to purchase, since the new project had been launched. As I expected, they chose Campbell-Walsh Urology. When the books were awarded, their faces were shining with gratitude. They said that they always wanted Campbell-Walsh Urology, along with other textbooks, to be their own. Severance faithfully contributed to Korea during his lifetime through support of preeminent medical missionaries such as Dr. Horace Newton Allen and Dr. Oliver R. Avison. His legacy lives on through the inheritance he left to Severance Hospital and through the J.L. Severance Fund, established by his descendants. 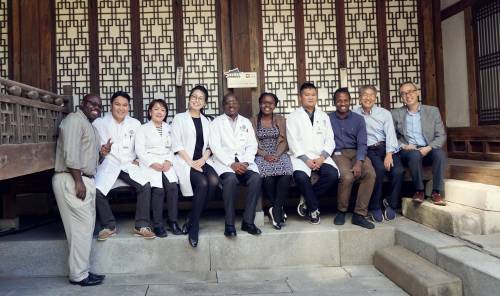 The support of the Severance family has helped Yonsei become a recognized academic medical center, establishing medical mission standards through education. Having been a beneficiary, Yonsei has taken a step forward to become a partner in mission with the PC(USA). It is an advancement of the relationship. Yonsei and the PC(USA) will create medical mission projects and manage them together. This new relationship has begun through these small but significant textbook awards. This partnership is an example of how God has used Presbyterian World Mission and Yonsei to bear fruit. My hope is that God’s kingdom will extend more powerfully and effectively through this partnership. Together we can work to provide academic training, building good Christian doctors around the world, ultimately glorifying God together. Lord, help us to serve you through partnerships that alleviate suffering in the world. Bless our work, that it may glorify you. In Jesus’ name we pray. Amen.